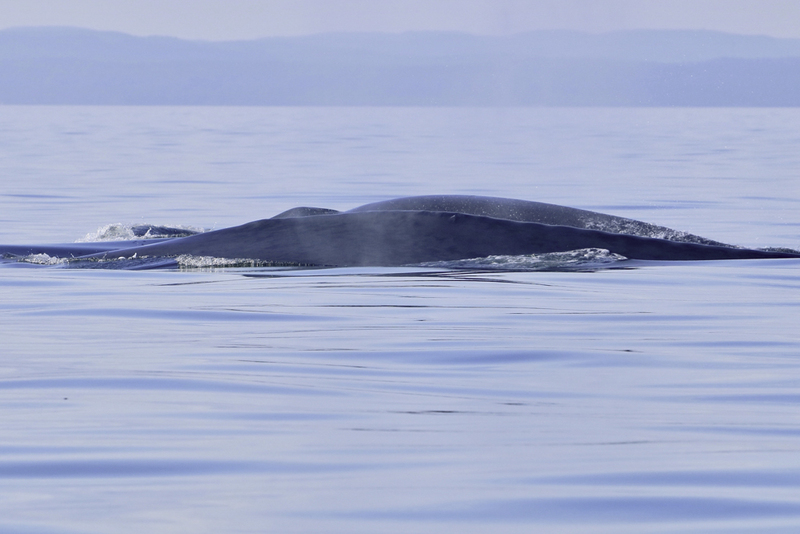 A fifth blue whale calf has been sighted in the St. Lawrence by our collaborator René Roy! B246 "Jaw-Breaker” and her calf, side by side. Photo: René Roy. This time, it’s B246 "Jaw-Breaker” turn to be a mother! The cow and calf pair was sighted by René Roy on August 11th in the St. Lawrence Estuary, off Pointe à Michel. Richard Sears had no trouble recognizing this well-known blue whale female, who was named Jaw Breaker by one of our former team members, Catherine Bershok, because of a large round circle that reminded her of the popular hard candy. B246 "Jaw-Breaker”. Photo: René Roy. This is the first reported calf of B246 "Jaw-Breaker”, and Richard wanted to make absolutely sure that it was indeed a calf and that we had not seen it before. "I checked the catalog because the calf is large - though of course not of adult size - and found no match. It does make sense that by now they would be quite large and close to being on its own” (after going through the wearing process). René only managed to take pictures of the left side of their body, but they are of excellent quality, and meaning they will provide a good basis for photo-identification if we see the calf again in the coming years, at which point we will hopefully be able to capture it from both sides. The calf of B246 "Jaw-Breaker” (reportedly her first). Photo: René Roy. 2018 has broken our previous record of three blue whale calves in one season, which was back in 2003, by two births! Could we be seeing more blue whale calves before the end of this season? Richard has seen calves as late as September, so it is not impossible. As far as we can tell, we have no explanation for such a high number of births after almost a decade without seeing any calves.